A farm located in Kemijärvi, Finland went through an extensive reform towards more ecological production, better working conditions and higher well-being of the cattle last year, being a perfect example of the turning point traditional agriculture is facing and of the benefits profitable investments entail. The farmer, Jaakko Lahti, had an old beam that was renovated to a cowshed where the cows are kept unchained and where milking is done by robots. The cowshed is now also inclusive of modern feeding kiosks, brushing machinery and new containers for cow silt. 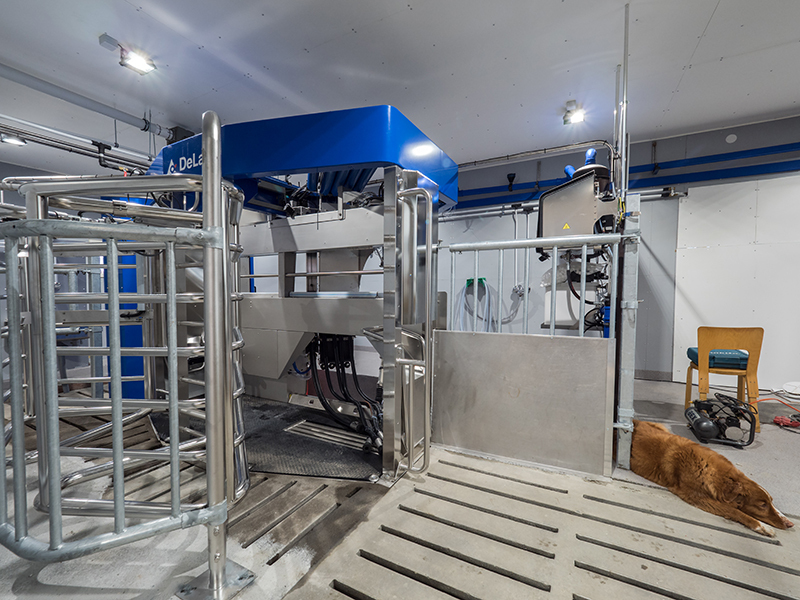 The milking robots recognize the cows and whether there is enough milk for the cow to get a milking. According to the Ministry of Agriculture and Forestry, the cowshed illuminance level should be 200lux. Also, the circadian rhythm of the cattle should be taken into consideration when designing lighting for cowsheds: that is to say, a cow needs 16 hours of daylight and 8 hours of rest. Proper rhythm has a straightforward effect on the vitality which, in turn, correlates with the milk production. 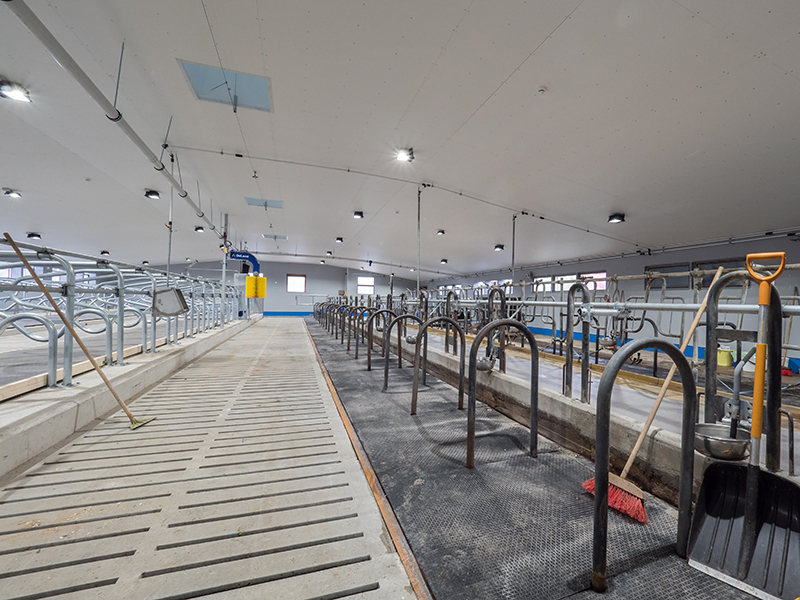 This is made possible in Jaakko Lahti's renewed cowshed with the help of the new lighting fixtures and their control systems and automatizations – now the circadian rhythm works automatically and without problems. Professional lighting design is playing a huge role not only in offices or houses but also in industrial use, especially when talking about agriculture and its special needs: with the help of lighting design, it is possible to increase the well-being of the cattle, productivity, safety and of course, energy savings. To meet every need a cowshed has, Winled lighting design was created before the project took off. The design included detailed 3D-modeling of the space and accurate calculations of the illuminance levels as well as of the energy savings. When designing lighting for a cowshed it was important to take the standards into consideration so that the lighting levels fulfill them effectively. In addition to this, the selection of the luminaires plays a huge role: since cowsheds, stables, piggeries and other animal shelters are challenging environments due to the constant dust, fumes and moisture, it goes without saying that the requirements for the lighting fixtures are higher than normally. Also, the lighting during the night time should be designed carefully to prevent stress in the animals. These aspects emphasize the importance of professional lighting design, the fixtures themselves and the control systems utilized. Former beam was 10 meters wide, and it was lit by fluorescent tubes from the 1980's, that used to be the recommended lighting solution before LED lighting started to increase in popularity. "The old fixtures were hard to replace and the plastic fasteners were already softened", tells Lahti. LEDs bring a huge improvement to this, since they are practically care-free and long-lasting. This added to the reduced energy consumption results in notable savings already after a short period of time. The surplus calculations show that the energy consumption is to reduce notably in accordance to the grown square meters. The old beam consumed around 1,5-2 kWh, whereas the new cowshed consumes around 1,2kWh – being almost 1,5 times bigger than before. The farmer – and the cows – have been very pleased with the result. Well-planned LED lighting can be seen not only in smaller energy bills but also in the safer, more comfortable and productive working conditions of the employees and animals of the farm.